Gravitational wave detectors might be able to detect much more than gravitational waves. 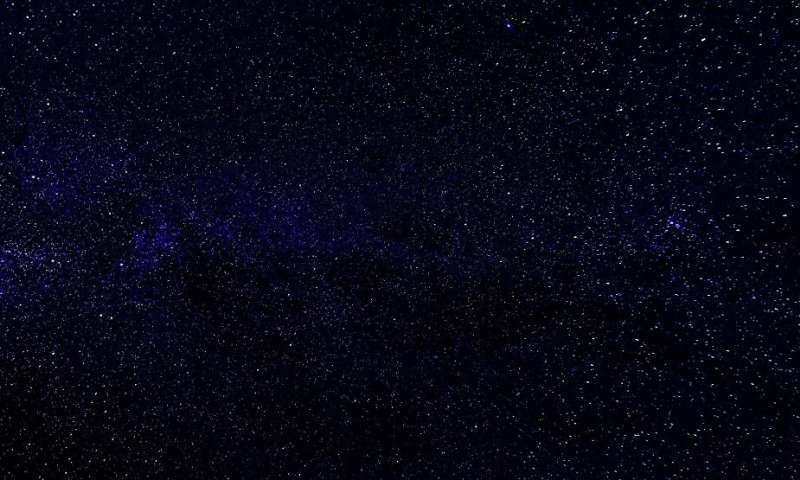 According to a new study, they could also potentially detect dark matter, if dark matter is composed of a particular kind of particle called a "dark photon." In the future, LIGO (Laser Interferometer Gravitational Wave Observatory) scientists plan to implement a search for dark photons, which will include certain previously unexplored regions of the dark photon parameter space. A team of physicists, Aaron Pierce, Keith Riles, and Yue Zhao from the University of Michigan, have reported their proposal for using gravitational wave detectors to search for dark matter in a recent paper published in Physical Review Letters. "This proposal nicely bridges the newly born field of gravitational wave astronomy with that of particle physics," Zhao told Phys.org. "Without any modifications, a gravitational wave detector can be used as a very sensitive direct dark matter detector, with the potential for a five-sigma discovery of dark matter." As the physicists explain in their paper, if dark photons have a very light mass, then they can be considered to behave like an oscillating background field, with the oscillation frequency determined by their mass. Gravitational wave detectors could potentially detect these oscillations because the oscillations may affect test objects placed in the gravitational wave detectors. For example, if two test objects located at different positions in the detector experience different displacements, this difference may be due to the relative phase of the dark photon field's oscillations at these different positions. The physicists expect that both present Earth-based gravitational wave detectors such as LIGO, as well as future space-based gravitational wave detectors such as LISA (Laser Interferometer Space Antenna), will have the ability to search for dark photon dark matter. Using more than one detector would allow for cross-checking and better sensitivity. In the future, the scientists plan to work on further developing the new dark matter search method and determining exactly what kind of signal a gravitational wave detector would receive if a dark photon were nearby. "We plan to push this work well beyond a theoretical proposal," Zhao said. "First, we plan to carry out the data analysis using a simplified signal model and a straightforward search algorithm. Then we will gradually refine our search method and include a detailed simulation of the signal and detector response." There is evidence of the supersolid dark matter every time a double-slit experiment is performed, as it is the supersolid dark matter that waves. Supersolid dark matter ripples when galaxy clusters collide and waves in a double-slit experiment, relating general relativity and quantum mechanics. I wonder if the same resources were dedicated to finding out why we are not able to account for all the matter in our galaxies instead of creating new particles would make a difference in our understanding? Are we that certain in our mass calculations that we need to derive new types of matter to describe what we are seeing? Also, for the record, the name dark matter is possibly the most missleading name in the history of science. Look at what global warming did to the increased entropy in weather systems? Long story short, I think we are becoming desperate and barking up the wrong tree trying to find answers! I wonder if the same resources were dedicated to finding out why we are not able to account for all the matter in our galaxies instead of creating new particles would make a difference in our understanding? Based on the fact that the very definition says we have no idea what it is. Neal D Tyson called in Ted I think and made the same statement in one his lectures as I have. In fact you can call it anything you like and every other name would be better. Its a black box concept and anything can be inside. Same applies for the unexplained acceleration of the universe. This is why I wonder if this theory would stand a more rigorous study of our understanding of inter stellar masses and velocities. I mean, we cant even say how much matter is in our own backyard, let alone across the universe. a particular kind of particle called a "dark photon." what is confusing most about your post is that you work with models and claim to be a scientist, so why would you be against testing in an existing detector to see if it matches SM and Theory? Stumpy You'r an arrogant buffoon, dark matter has not be discovered. I don't give a chit if it has 100 nobel prizes by it's name. projection from a pseudoscience scholar of questionable literacy and an inability to spell - is it quarter shooters at the club tonight? where, pray tell, did I state it had been discovered? you're ranting about a comment that wasn't made and then you state you don't care how many nobel prizes it has? you do realise that delusions and hallucinations don't get nobel prizes, right? you do realize that delusions and hallucinations don't get Nobel prizes, right? Trumpt is trying for it. The problem is that the sensitivity also detects Muonic and Neutrino mass effects caused by the fronts of high-energy gammarays, high-energy neutrinos and high-energy cosmic rays (emanating from such cataclysmic BHs and NSs merging events) impacting Earth's atmosphere and sending waves of Muons to pass through the LiGOs. And if the LIGO is space-based, then the problem is just as bad because then all that high-energy stuff is going to impact LIGO test masses directly, and not just the laser-space-path between test masses. Increased sensitivity is futile if all that stuff is affecting it more than puny effects of their hypothetical "dark photon oscillating background field". And anyway, if DM is allegedly everywhere as a background ALREADY, then the effect of same is ALREADY PART of observed/measured parameters of test mass/motion etc in all existing QM experiments at that level of sensitivity. They have to acknowledge all that, and then 'revisit' their assumptions. Gravitational wave detectors detect darkmatter being composed of particles of darkphotons where LIGO search's for darkphotons in darkphotons region of the vacuum. What is this newly theorised gravitational particle darkphotons; is this conformation the traditional lightphotons that sustains earthly life emanating from the trillion upon trillion stars residing in the trillions of galaxies in the vacuum where to date not one hair of these darkphotons has been seen bristling from the only photons in the vacuum, lightphotons. There we have it; Photons have inertial mass and consequently gravity. "Whart1984> what is a - very subtle quantum fluctuations"
My favourite phrase "the quantum fluctuations" A little used phrase outside the confines of theoretical worldly darkphotons and virtual particles of zero point energy where outside into the macro world it has a common use describing particles which of their nature are physically in the realms of the quantum fluctuations of fantasy. What exactly are the "subtle quantum fluctuations" and the context in which you're implementing them Whart1984, as this is a fascinating insight into space-time like the stained glass which we would illuminate by light from side as the heavenly light spreads it shimmer coloured light through those religiously painted heavenly stained glass cathedral panes.